Courtyard Columbus West/Hilliard showcases a brand new modern style and home-like comfort for your Hilliard, Ohio hotel visit. Whether you're in the area for work or play, you're sure to feel relaxed and invigorated at our hotel, thanks to our friendly service and great amenities. All 150 of our hotel rooms and suites offer marble bathrooms, pillowtop mattresses, and free high-speed Wi-Fi, as well as ergonomic desks. Fuel up for a busy day in Hilliard with a visit to The Bistro, offering a delicious array of hot and continental breakfast items, or stop by The Market, 24 hours a day. Other perks for your stay include a heated saltwater indoor pool and a fitness center, as well as 5,208 square feet of versatile venue space for meetings, weddings, and special events. And thanks to our terrific location, just off Interstate 70 and 270, our hotel places you moments from downtown Columbus, Ohio State University, and attractions like Hollywood Casino. 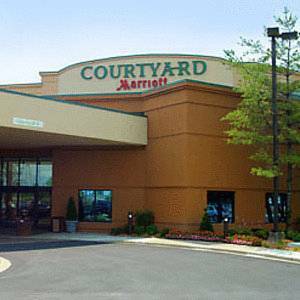 Plan your visit today here at the Courtyard Columbus West!